A reliable, dynamic and progressive training organisation whose aim is to unlock London by empowering everyone to cycle confidently and safely. Interested in becoming a cycling instructor or are already qualified? Cycle Confident made the international news! Check out this short film from CBC News, Canada's version of the BBC, who did a nice news segment on getting more women cycling in London. Cycle Confident figures prominently in the piece as one of the cycle training organisations. 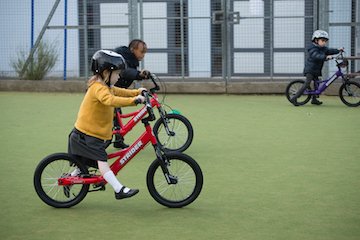 Cycle Confident now offers balance bike training. Click here for more information. "I learned how to cycle the first time in my life at the age of 32 - many thanks to Dave, my cycle instructor, Cycle Confident and Barnet Council." K.B. "Experiencing first-hand what it’s like to be a modern-day cyclist, especially for those who had not been in the saddle for a while, was incredibly powerful. Understanding what a cyclist might do next, and why, proved to be useful education.”- Mel H.
"My daughter had a 1:1 season in e17 yesterday with the lovely Matt. He was very patient with us all and had her up riding independently in less than 30 mins! Have been on various courses now and have never experienced anything less than 5* treatment!!!! Would recommend!!! "- Lisa D.